Postcard from Holland is a regular feature on this blog. On Wednesdays I post a card from my collection of vintage postcards. Today: A postcard from Leiden. 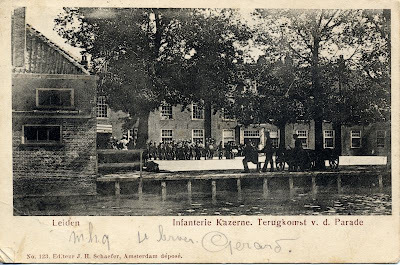 This postcard is titled Infanterie Kazerne. Terugkomst v.d. Parade (Infantry Barracks. Return of the Parade). The date mark is hard to decipher, but the card was sent on Christmas day in the first decade of the 20th century.